Student-athletes subject to random drug testing at an Oregon high school were almost four times less likely to use drugs than their counterparts at a similar school who were not tested, a study shows. The one-year pilot study by researchers at Oregon Health & Sciences University compared Wahtonka High School in The Dalles, where all student-athletes were subject to random testing, and Warrenton High School, a demographically similar school near Astoria, where they were not. Of the 135 athletes subject to the random testing at Wahtonka, only 5.3 percent said they were using illicit drugs by the end of the school year, versus 19.4 percent of the 141 athletes at Warrenton. They also were three times less likely to use performance-enhancing substances like steroids, according to the survey responses, which were anonymous. 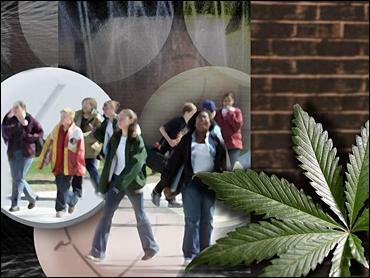 The study, conducted during the 1999-2000 school year, was funded by the National Institute on Drug Abuse, an arm of the National Institutes of Health. The results are published in next month's Journal of Adolescent Health. "The differences between the schools were dramatic," said Dr. Linn Goldberg, a lead researcher in the study. "And the differences between the non-athletes (who were not tested at either school but who filled out questionnaires about drug use) were not significantly there" - 32.2 percent at Warrenton and 26.6 percent at Wahtonka. The study comes six months after the issue was thrown into the spotlight by the U.S. Supreme Court. In June, the court ruled that children attending public schools can be required to participate in drug testing if they join any competitive after-school activity, from football to chess. Merry Holland, principal at Wahtonka, said the school has continued to test athletes since the study ended. She said she believes the program has helped curb drug use. But, she said, the drug testing has also led some students to switch to substances that are more difficult to track, like beer. "There are a lot of parties with alcohol," she said. "If they want to stay with sports, and participate, they might switch to something they think is harder to detect." Over the past few years, about 5 percent of schools nationwide have required that athletes be drug tested. About two percent have tested students in other activities. The Oregon pilot study is the forerunner of a wider, three-year study at 13 Oregon high schools. Dubbed SATURN, for Student Athlete Testing Using Random Notification, the wider study is meant to examine whether the threat of testing really keeps kids away from drugs. It was suspended in its third year after a federal agency expressed concerns about some of the methodology used in the study's latter two years. The Office of Human Research Policy said the study violated a number of federal regulations by not properly obtaining informed consent from children or protecting research subjects from coercive environments. The survey results used in the published study were not affected. OHSU issued a response this month offering to better ensure student confidentiality, to stop using principals and coaches to solicit participation in some schools and to end financial incentives for participating schools. Goldberg said researchers are awaiting word on whether the study will be reinstated.